The Second World War saw the emergence of a Canadian national identity, crafted by the actions of the government and military, and articulated through the popular literature of the era. During the war, maintaining the Canadian economy was essential, and so the government sought to prevent the diversion of Canadian funds to other nations unless absolutely necessary. The War Exchange Conservation Act was introduced to restrict luxury imports including popular fiction. This created a demand for Canadian equivalents. One form of Canadian popular fiction which emerged from the War Exchange Conservation Act was the Canadian Whites, a collection of comic books which were iconically Canadian in both their production and content. The War Exchange Conservation Act not only encouraged the investment of Canadian money in its own market, it created an opportunity for Canadian artists to showcase their talents and for Canada to take pride in the abilities of its citizens. In this paper, I will be focusing on the character Captain Red Thortan from A. Cooper’s “Capt. Red Thortan” featured in Active Comics No. 1 published in 1942. Captain Red Thortan reveals the inherent hypocrisy of Canadian society by representing the emerging Canadian nationalism of the Second World war despite the transgressive reality of racist, anti-democratic, and discriminatory practices in Canada. 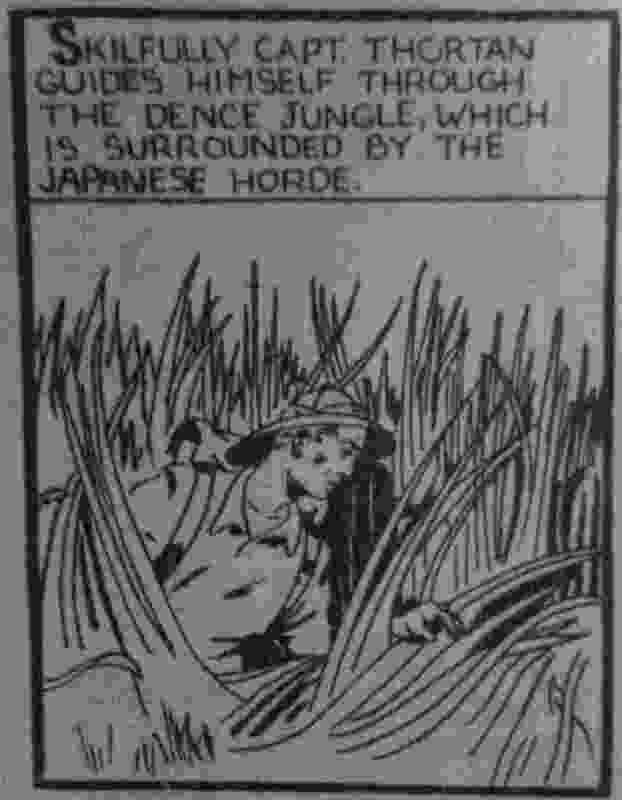 Captain Red Thortan in search of his captured companion, Lieutenant Harley, in the Malayas. The protagonist and namesake of the “Capt. Red Thortan” comics is an iconic Canadian hero, reflecting inherent cultural assumptions regarding who merits idolization based on gender, race, loyalties, language, and ethics. Captain Red Thortan is depicted as an Anglo-Saxon male in the military. 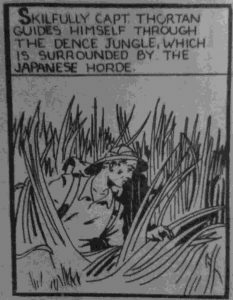 He also presents Canada’s loyalty to Britain by protecting the British Malayas from Japanese invaders and saving a British unit from impending harm (Cooper 32). Captain Red Thortan speaks exclusively in English, reflecting British tradition as well as a discontent with alterity. This appeals to the majority of the Canadian population and the narrative of Anglo-Saxon superiority. The democratic ethics of Captain Red Thortan, along with the public’s desire to eradicate all anti-democratic people, makes the discrimination against those who do not conform to the ideals of the Anglo-Saxon Canadian evident. The Canadian war hero, as embodied in Captain Red Thortan, is qualified through masculinity, Anglo-Saxon heritage, loyalty to Britain, English language, and democratic values. World War II was a milestone for Canadian identity as it was the first war in which Canada acted independently of Britain. Historically, Canada had loyalties to Britain as a member of the British Commonwealth alongside nations such as India, Australia, and the Malayas. Canada officially declared war on Germany one week after Britain, showcasing its independence while still maintaining loyalty to Britain out of respect rather than obligation. Canada maintained this relationship through military actions, allying itself with Britain first and foremost. Canada hosted British children in the homes and schools of Canadian families in 1940. The British Commonwealth Air Training Plan also instated air training schools and ancillary units in rural Canadian communities (The Canadian Encyclopedia). The formal cessation of Canada’s obligation to serve Britain allowed for the emergence of an innovative and modern national identity. Canada gained the ability to declare independent values and standards. Gatekeeping in the Military: Who are Canada’s Heroes? In 1939, Prime Minister Mackenzie King inquired as to Canadian popular opinion and due to French-Canadian dissent, chose that enlistment would be voluntary. However, within a year, under pressure of societal demands, he rescinded his promise and instituted conscription across the nation (The Canadian War Museum). The process of conscription began with the distribution of the national registration: a series of questions which were to be used to determine which individuals were eligible to serve and their skills. Military service has a psychological association with national loyalty and rights to citizenship: “Being prepared to die and to kill on behalf of the nation continues to be an ideological cornerstone of national belonging and a sound qualification for the material benefits of democratic citizenship” (Ware 321). The social value ascribed to those who serve in the military contributes to the concept of the national hero. The Canadian government’s selective choice in who among its citizens could serve in the military undermined the status of certain minority ethnic groups within Canadian society. This gatekeeping was an underlying principle of the national registration and the ensuing conscription for service: “[M]obilization officials charged with the calling up of men into the Armed Forces were instructed to classify men identified as Negros within their internal documents, ‘along with the Chinese, Japanese etc., as “not acceptable for non-medical reasons” (Department of Labour 1943a, n.p. )’ (Thompson 710)”. The explicit exclusion of certain ethnic groups from serving in the military is an injustice that isolates such groups from being included in the concept of Canadiana. The racist exclusion of these groups from military service subjected them to additional discrimination as even Canadians who served at on the homefront were disdained and deemed “zombies”: lacking human decency, subhuman beings (The Canadian Encyclopedia). Serving in the army was viewed by the majority as an act of duty and valour, and being willing to sacrifice one’s life to defend democracy overseas was regarded as the greatest of such acts. In “Captain Red Thortan”, the Axis nations of the Second World War are referred to as “the enemies of democracy” (Cooper 18). This mentality of the war as a defense of political beliefs rather than a war between countries juxtaposes the Allied countries and the Axis countries, distinguishing a disdain for the alterity of non-democratic nations. However, this implies that in order to be a member of the Allied nations, a nation would need to be democratic. This implicit requirement demands the questioning of Canadian democracy. In 1939, the Provincial Elections Act prevented Chinese, Japanese, Hindus, and Indians from voting in British Columbia. That same year, women were deemed eligible to vote in Quebec. The isolation of certain minority groups from their right to vote in British Columbia were repealed in 1947. It did not extend to all groups but it was a conscious start to right the wrongs done in the name of national interest: “This discovery of prejudice and discrimination, and the steps taken to safeguard human rights, were remarkable in a country where discriminatory practices remained largely unchallenged until the war (Patrias and Frager 1).” Discrimination had been an implicit subtext within the narrative of Canadian national identity. Canada is, after all, a nation formed by frontier men, who took advantage of the groups native to the region for personal profit. The repeal of 1947 still prevented Japanese and Aboriginals from voting and certain other groups lost their right to vote without performing military service. The voting rights for all racial groups within the body of Canada was not completely restored until 1960 (The Canadian Human Rights Commission). The implications of these racial biases is that there was one concept of a true Canadian, which was a descendant of Britain, maintaining British values. 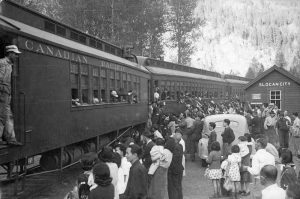 Japanese internees preparing to board a train from Slocan City, B.C. where they were relocated. Photographer unknown, taken in 1946. While not explicitly violent, this segregation creates a national divide within Canada, reinforcing prejudices against alterity. Even though one could possibly obtain a Certificate of Exemption, all groups who visually conform to the image of an enemy alien individual were subject to question and to prejudices based on the government narrative of these individuals as suspicious. This exemplifies the disparity between Canada’s desire for the participation of previous civilians in the war through conscription with its racist dialogue against the right of minority members of its ranks to merit citizenship. Characters like Captain Red Thortan were important in Canadian society during the Second World War. He was a role model for the youth who were the readers of Active Comics. In wartime especially, it is important for children to have a strong role model encouraging the traits of strength, valour, and loyalty which are commonly ascribed to the masculine. The choice for the embodiment of Canadiana to be an English speaking Anglo-Saxon male is a reflection of the sociopolitical climate of World War Two Canada. The lack of representation of minority groups in literary positions of power and influence is a direct product of the racist rhetoric which was then prevalent. Yet, the White image of a Canadian Military hero is problematic due to the social theories of Anglo-Saxon supremacy that were accepted during the Second World War. Canada’s explicit action in preventing certain ethnic groups from meriting citizenship mirrors the anti-democratic attitudes embraced by the Nazi regime. The character of the Canadian Military hero has historically held inherent prejudices against certain groups. It is because of this blind hypocrisy that the representation of Canadian Military heroes in popular literature such as “Capt. Red Thortan” must continually be questioned to reveal the underlying morality of such characters. Cooper, A. “Capt. Red Thortan.” Active Comics, No. 1, Commercial Signs of Canada, 1942. Library and Archives Canada. ‘Embarkation of W.W.II Japanese Internees from Slocan City, B.C., Probably in 1946’. Library and Archives Canada, 1946, http://central.bac-lac.gc.ca/.item?app=fondsandcol&op=img&id=a103565-v8. Patrias, Carmela, and Ruth Frager. ‘“This Is Our Country, These Are Our Rights”: Minorities and the Origins of Ontario’s Human Rights Campaigns’. Canadian Historical Review, vol. 82, no. 1, 2001, pp. 1–35. Scholars Portal Journals, doi:10.3138/CHR.82.1.1. The Canadian Encyclopedia. Canadian Children and the Second World War. https://www.thecanadianencyclopedia.ca/en/article/canadian-children-and-wwii. Accessed 1 Oct. 2018. The Canadian Human Rights Commission. ‘Voting Rights’. Human Rights in Canada: A Historical Perspective, https://www.chrc-ccdp.gc.ca/historical-perspective/en/browseSubjects/votingRights.asp. Accessed 13 Nov. 2018. The Canadian War Museum. ‘Conscription – Canada and the War’. Democracy at War, https://www.warmuseum.ca/cwm/exhibitions/newspapers/canadawar/conscription_e.shtml. Accessed 1 Oct. 2018. Thompson, Scott. ‘Real Canadians: Exclusion, Participation, Belonging, and Male Military Mobilization in Wartime Canada, 1939-45’. Journal of Canadian Studies/Revue d’études Canadiennes, vol. 50, no. 3, 2016, pp. 691–726. Ware, Vron. ‘Whiteness in the Glare of War: Soldiers, Migrants and Citizenship’. Ethnicities, vol. 10, no. 3, 2010, pp. 313–30. Scholars Portal Journals, doi:10.1177/1468796810372297.